Spain’s Rafael Nadal after winning the final of the French Open. Imagine a tennis world in which Rafael Nadal never picked up a racket. Some of his rivals must have. Novak Djokovic could be excused for daydreaming about it after Nadal beat him in Sunday’s French Open final, 3-6, 7-5, 6-2, 6-4.
Who would benefit most in a hypothetical world without Nadal? Well, let’s divvy up Nadal’s 14 Grand Slam titles. 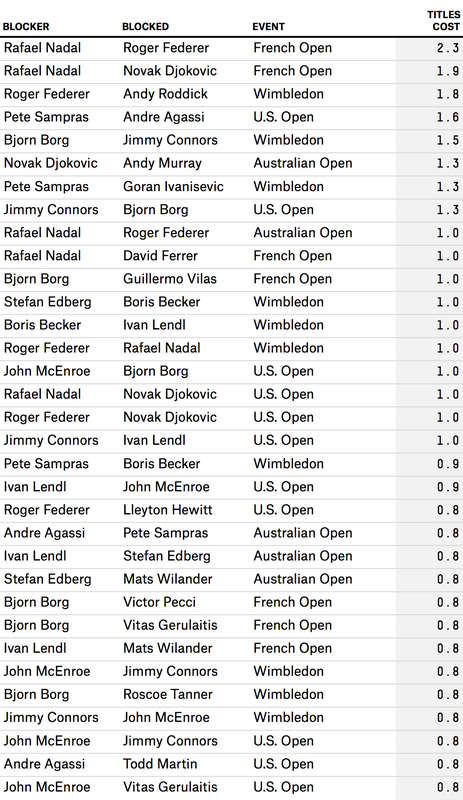 Although he might never reach Roger Federer’s record of 17 major titles, Nadal already leads Federer and all other Open-era greats in the ranking of biggest obstacle to a single Grand Slam title. 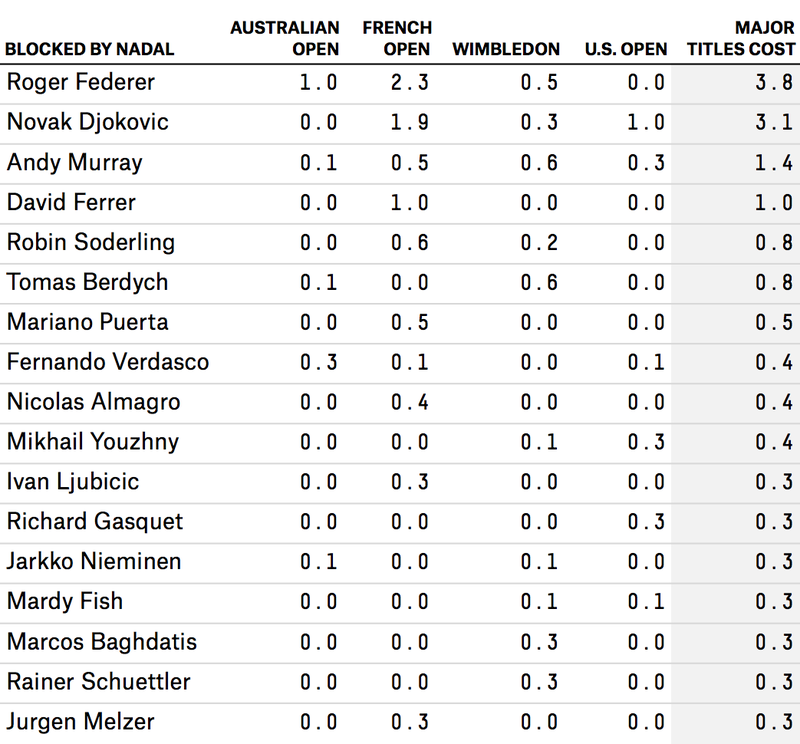 To quantify this, I give you the “title block.” A title block isn’t an official tennis stat — I made it up. Here’s how it works: If Nadal beat a player in a final, I figure that given the next best possible opponent, the man who lost to Nadal would, on average, have a 50 percent chance of winning. So that win counts as half a title block. (This may undersell some blocked players’ chances of winning, but because this is hypothetical, treating unplayed matchups as coin flips is safest.) Similarly, a semifinal win cost the loser a quarter of a Grand Slam title and so on. Then I summed the title blocks for each Grand Slam tournament. I used data from Tennis Abstract, adding data from the just-completed French Open from rolandgarros.com. I ignored walkovers but included mid-match retirements. No matter how many times Nadal bites trophies, they don’t get broken up into pieces. But because this is a what-if exercise, these hypothetical titles come in fractions. 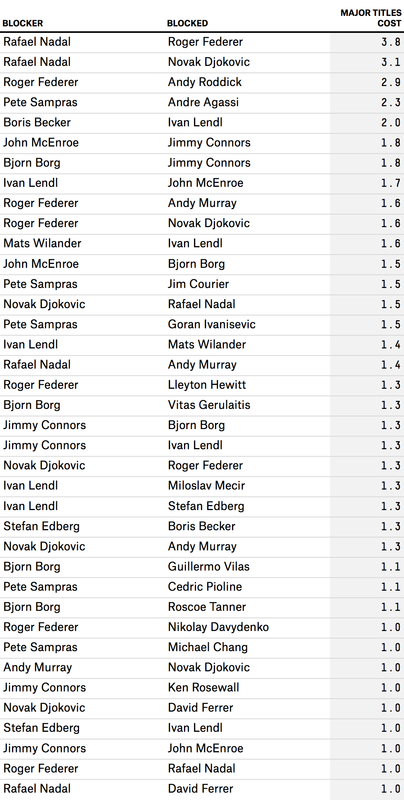 If Nadal beats a player enough times, those fractional titles can start adding up. Nadal’s four wins in French Open finals over Federer, plus one semifinal ousting, count for two and one-quarter titles that Nadal has deprived Federer. Meanwhile, by beating Djokovic in two French Open finals, three semifinals and a quarterfinal, Nadal has cost him one and seven-eighths French Open titles. In a non-Nadal world, Djokovic would have one more U.S. Open crown in addition to those one or two French Opens. Federer would have another Australian Open title, along with those two or three additional French Open titles. And David Ferrer would no longer be in the running for best player never to win a major, because he’d have lifted a French Open trophy. We can expand this to other tennis greats. Let’s skim the cream off the top of the tennis world one great player at a time: Let’s get rid of each of the 12 men who have won at least six Grand Slam singles titles since the Open era of pro tennis began in 1968, one by one. We’ll add an unlucky No. 13 in Murray, who has had the misfortune to compete in an era dominated by three of those 12 men: Federer, Nadal and Djokovic. Nadal’s dominance of Federer and Djokovic rank first and second, respectively, among title blocks at the four Grand Slam tournaments, ahead of other famous blocks like Federer’s of Andy Roddick at Wimbledon, Pete Sampras’s of Andre Agassi at the U.S. Open and Bjorn Borg of Jimmy Connors at Wimbledon. Nadal’s defeats of Ferrer at the French Open the Top 10: By costing Ferrer one title, Nadal also takes the 10th spot on the list. Overall, Nadal has blocked Federer from three and three-quarters major titles; Federer would have 21 without Nadal. That’s No. 1 on the title-blocks list overall, and Nadal’s blockage of Djokovic from almost four major titles is No. 2 on the overall list. Don’t pity Federer too much, though: He did win the French Open in 2009, the one year in the past decade that Nadal didn’t. Djokovic still hasn’t won the clay-court major. Murray, meanwhile, would have more than triple his current total of two Grand Slam titles if not for Federer, Nadal and Djokovic, who each have cost him more than one. Nadal has had the better of all of his rivals, but he, too, could have won more majors without Federer, Djokovic, et al. By beating Nadal in two Wimbledon finals, Federer has cost Nadal a third Wimbledon title to go with the two Nadal has won. Djokovic, meanwhile, beat Nadal in the finals of three consecutive Grand Slam tournaments over 2011 and 2012, which cost Nadal one and a half major titles.